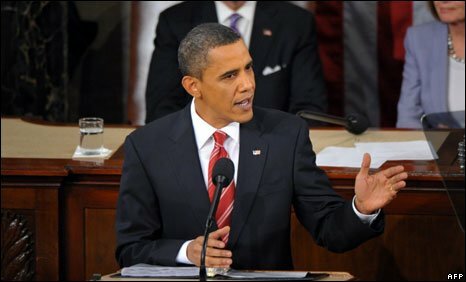 US President Barack Obama has been delivering his first State of the Union address to Congress. Following is a full transcript of his speech. It's tempting to look back on these moments and assume that our progress was inevitable - that America was always destined to succeed. But when the Union was turned back at Bull Run, and the Allies first landed at Omaha Beach, victory was very much in doubt. When the market crashed on Black Tuesday, and civil rights marchers were beaten on Bloody Sunday, the future was anything but certain. These were the times that tested the courage of our convictions, and the strength of our union. And despite all our divisions and disagreements, our hesitations and our fears, America prevailed because we chose to move forward as one nation, as one people. One year ago, I took office amid two wars, an economy rocked by a severe recession, a financial system on the verge of collapse, and a government deeply in debt. Experts from across the political spectrum warned that if we did not act, we might face a second depression. So we acted - immediately and aggressively. And one year later, the worst of the storm has passed. For these Americans and so many others, change has not come fast enough. Some are frustrated; some are angry. They don't understand why it seems like bad behaviour on Wall Street is rewarded, but hard work on Main Street isn't; or why Washington has been unable or unwilling to solve any of our problems. They're tired of the partisanship and the shouting and the pettiness. They know we can't afford it. Not now. So we face big and difficult challenges. And what the American people hope - what they deserve - is for all of us, Democrats and Republicans, to work through our differences; to overcome the numbing weight of our politics. For while the people who sent us here have different backgrounds, different stories, different beliefs, the anxieties they face are the same. The aspirations they hold are shared: a job that pays the bills; a chance to get ahead; most of all, the ability to give their children a better life. You know what else they share? They share a stubborn resilience in the face of adversity. After one of the most difficult years in our history, they remain busy building cars and teaching kids, starting businesses and going back to school. They're coaching Little League and helping their neighbours. One woman wrote to me and said, "We are strained but hopeful, struggling but encouraged." It's because of this spirit - this great decency and great strength -that I have never been more hopeful about America's future than I am tonight. Despite our hardships, our union is strong. We do not give up. We do not quit. We do not allow fear or division to break our spirit. In this new decade, it's time the American people get a government that matches their decency; that embodies their strength. Our most urgent task upon taking office was to shore up the same banks that helped cause this crisis. It was not easy to do. And if there's one thing that has unified Democrats and Republicans, and everybody in between, it's that we all hated the bank bailout. I hated it. You hated it. It was about as popular as a root canal. So I supported the last administration's efforts to create the financial rescue program. And when we took that program over, we made it more transparent and more accountable. And as a result, the markets are now stabilized, and we've recovered most of the money we spent on the banks. Most but not all. To recover the rest, I've proposed a fee on the biggest banks. Now, I know Wall Street isn't keen on this idea. But if these firms can afford to hand out big bonuses again, they can afford a modest fee to pay back the taxpayers who rescued them in their time of need. Now, let me repeat: We cut taxes. We cut taxes for 95% of working families. We cut taxes for small businesses. We cut taxes for first-time homebuyers. We cut taxes for parents trying to care for their children. We cut taxes for 8 million Americans paying for college. Because of the steps we took, there are about two million Americans working right now who would otherwise be unemployed. Two hundred thousand work in construction and clean energy; 300,000 are teachers and other education workers. Tens of thousands are cops, firefighters, correctional officers, first responders. And we're on track to add another one and a half million jobs to this total by the end of the year. The plan that has made all of this possible, from the tax cuts to the jobs, is the Recovery Act. That's right -- the Recovery Act, also known as the stimulus bill. Economists on the left and the right say this bill has helped save jobs and avert disaster. But you don't have to take their word for it. Talk to the small business in Phoenix that will triple its workforce because of the Recovery Act. Talk to the window manufacturer in Philadelphia who said he used to be sceptical about the Recovery Act, until he had to add two more work shifts just because of the business it created. Talk to the single teacher raising two kids who was told by her principal in the last week of school that because of the Recovery Act, she wouldn't be laid off after all. But I realize that for every success story, there are other stories, of men and women who wake up with the anguish of not knowing where their next pay cheque will come from; who send out resumes week after week and hear nothing in response. That is why jobs must be our number-one focus in 2010, and that's why I'm calling for a new jobs bill tonight. We should start where most new jobs do - in small businesses, companies that begin when - companies that begin when an entrepreneur -- when an entrepreneur takes a chance on a dream, or a worker decides it's time she became her own boss. Through sheer grit and determination, these companies have weathered the recession and they're ready to grow. But when you talk to small business owners in places like Allentown, Pennsylvania, or Elyria, Ohio, you find out that even though banks on Wall Street are lending again, they're mostly lending to bigger companies. Financing remains difficult for small business owners across the country, even those that are making a profit. So tonight, I'm proposing that we take $30 billion of the money Wall Street banks have repaid and use it to help community banks give small businesses the credit they need to stay afloat. I'm also proposing a new small business tax credit -- one that will go to over one million small businesses who hire new workers or raise wages. While we're at it, let's also eliminate all capital gains taxes on small business investment, and provide a tax incentive for all large businesses and all small businesses to invest in new plants and equipment. Tomorrow, I'll visit Tampa, Florida, where workers will soon break ground on a new high-speed railroad funded by the Recovery Act. There are projects like that all across this country that will create jobs and help move our nation's goods, services, and information. We should put more Americans to work building clean energy facilities - and give rebates to Americans who make their homes more energy-efficient, which supports clean energy jobs. And to encourage these and other businesses to stay within our borders, it is time to finally slash the tax breaks for companies that ship our jobs overseas, and give those tax breaks to companies that create jobs right here in the United States of America. Now, the House has passed a jobs bill that includes some of these steps. As the first order of business this year, I urge the Senate to do the same, and I know they will. They will. People are out of work. They're hurting. They need our help. And I want a jobs bill on my desk without delay. For those who make these claims, I have one simple question: How long should we wait? How long should America put its future on hold? You see, Washington has been telling us to wait for decades, even as the problems have grown worse. Meanwhile, China is not waiting to revamp its economy. Germany is not waiting. India is not waiting. These nations -- they're not standing still. These nations aren't playing for second place. They're putting more emphasis on math and science. They're rebuilding their infrastructure. They're making serious investments in clean energy because they want those jobs. Well, I do not accept second place for the United States of America. Now, the House has already passed financial reform with many of these changes. And the lobbyists are trying to kill it. But we cannot let them win this fight. And if the bill that ends up on my desk does not meet the test of real reform, I will send it back until we get it right. We've got to get it right. Next, we need to encourage American innovation. Last year, we made the largest investment in basic research funding in history - an investment that could lead to the world's cheapest solar cells or treatment that kills cancer cells but leaves healthy ones untouched. And no area is more ripe for such innovation than energy. You can see the results of last year's investments in clean energy -- in the North Carolina company that will create 1,200 jobs nationwide helping to make advanced batteries; or in the California business that will put a thousand people to work making solar panels. I am grateful to the House for passing such a bill last year. And this year I'm eager to help advance the bipartisan effort in the Senate. I know there have been questions about whether we can afford such changes in a tough economy. I know that there are those who disagree with the overwhelming scientific evidence on climate change. But here's the thing - even if you doubt the evidence, providing incentives for energy-efficiency and clean energy are the right thing to do for our future - because the nation that leads the clean energy economy will be the nation that leads the global economy. And America must be that nation. Now, this year, we've broken through the stalemate between left and right by launching a national competition to improve our schools. And the idea here is simple: Instead of rewarding failure, we only reward success. Instead of funding the status quo, we only invest in reform -- reform that raises student achievement; inspires students to excel in math and science; and turns around failing schools that steal the future of too many young Americans, from rural communities to the inner city. In the 21st century, the best anti-poverty program around is a world-class education. And in this country, the success of our children cannot depend more on where they live than on their potential. To make college more affordable, this bill will finally end the unwarranted taxpayer subsidies that go to banks for student loans. Instead, let's take that money and give families a $10,000 tax credit for four years of college and increase Pell Grants. (Applause.) And let's tell another one million students that when they graduate, they will be required to pay only 10 percent of their income on student loans, and all of their debt will be forgiven after 20 years -- and forgiven after 10 years if they choose a career in public service, because in the United States of America, no one should go broke because they chose to go to college. And by the way, it's time for colleges and universities to get serious about cutting their own costs - because they, too, have a responsibility to help solve this problem. This year, we will step up refinancing so that homeowners can move into more affordable mortgages. And it is precisely to relieve the burden on middle-class families that we still need health insurance reform. Yes, we do. Now, let's clear a few things up. I didn't choose to tackle this issue to get some legislative victory under my belt. And by now it should be fairly obvious that I didn't take on health care because it was good politics. I took on health care because of the stories I've heard from Americans with preexisting conditions whose lives depend on getting coverage; patients who've been denied coverage; families -- even those with insurance -- who are just one illness away from financial ruin. And by the way, I want to acknowledge our First Lady, Michelle Obama, who this year is creating a national movement to tackle the epidemic of childhood obesity and make kids healthier. Thank you. She gets embarrassed. Our approach would preserve the right of Americans who have insurance to keep their doctor and their plan. It would reduce costs and premiums for millions of families and businesses. And according to the Congressional Budget Office -- the independent organization that both parties have cited as the official scorekeeper for Congress -- our approach would bring down the deficit by as much as $1 trillion over the next two decades. Still, this is a complex issue, and the longer it was debated, the more sceptical people became. I take my share of the blame for not explaining it more clearly to the American people. And I know that with all the lobbying and horse-trading, the process left most Americans wondering, "What's in it for me?" At the beginning of the last decade, the year 2000, America had a budget surplus of over $200 billion. By the time I took office, we had a one-year deficit of over $1 trillion and projected deficits of $8 trillion over the next decade. Most of this was the result of not paying for two wars, two tax cuts, and an expensive prescription drug program. On top of that, the effects of the recession put a $3 trillion hole in our budget. All this was before I walked in the door. I'm absolutely convinced that was the right thing to do. But families across the country are tightening their belts and making tough decisions. The federal government should do the same. So tonight, I'm proposing specific steps to pay for the trillion dollars that it took to rescue the economy last year. We will continue to go through the budget, line by line, page by page, to eliminate programs that we can't afford and don't work. We've already identified $20 billion in savings for next year. To help working families, we'll extend our middle-class tax cuts. But at a time of record deficits, we will not continue tax cuts for oil companies, for investment fund managers, and for those making over $250,000 a year. We just can't afford it. Now, even after paying for what we spent on my watch, we'll still face the massive deficit we had when I took office. More importantly, the cost of Medicare, Medicaid, and Social Security will continue to skyrocket. That's why I've called for a bipartisan fiscal commission, modelled on a proposal by Republican Judd Gregg and Democrat Kent Conrad. This can't be one of those Washington gimmicks that lets us pretend we solved a problem. The commission will have to provide a specific set of solutions by a certain deadline. Now, yesterday, the Senate blocked a bill that would have created this commission. So I'll issue an executive order that will allow us to go forward, because I refuse to pass this problem on to another generation of Americans. And when the vote comes tomorrow, the Senate should restore the pay-as-you-go law that was a big reason for why we had record surpluses in the 1990s. Now, I know that some in my own party will argue that we can't address the deficit or freeze government spending when so many are still hurting. And I agree -- which is why this freeze won't take effect until next year - when the economy is stronger. That's how budgeting works. But understand -- understand if we don't take meaningful steps to rein in our debt, it could damage our markets, increase the cost of borrowing, and jeopardize our recovery -- all of which would have an even worse effect on our job growth and family incomes. Rather than fight the same tired battles that have dominated Washington for decades, it's time to try something new. Let's invest in our people without leaving them a mountain of debt. Let's meet our responsibility to the citizens who sent us here. Let's try common sense. A novel concept. To do that, we have to recognize that we face more than a deficit of dollars right now. We face a deficit of trust -- deep and corrosive doubts about how Washington works that have been growing for years. To close that credibility gap we have to take action on both ends of Pennsylvania Avenue -- to end the outsized influence of lobbyists; to do our work openly; to give our people the government they deserve. With all due deference to separation of powers, last week the Supreme Court reversed a century of law that I believe will open the floodgates for special interests -- including foreign corporations -- to spend without limit in our elections. I don't think American elections should be bankrolled by America's most powerful interests, or worse, by foreign entities. They should be decided by the American people. And I'd urge Democrats and Republicans to pass a bill that helps to correct some of these problems. I'm also calling on Congress to continue down the path of earmark reform. Democrats and Republicans. Democrats and Republicans. You've trimmed some of this spending, you've embraced some meaningful change. But restoring the public trust demands more. For example, some members of Congress post some earmark requests online. Tonight, I'm calling on Congress to publish all earmark requests on a single Web site before there's a vote, so that the American people can see how their money is being spent. Of course, none of these reforms will even happen if we don't also reform how we work with one another. Now, I'm not naïve. I never thought that the mere fact of my election would usher in peace and harmony - and some post-partisan era. I knew that both parties have fed divisions that are deeply entrenched. And on some issues, there are simply philosophical differences that will always cause us to part ways. These disagreements, about the role of government in our lives, about our national priorities and our national security, they've been taking place for over 200 years. They're the very essence of our democracy. But what frustrates the American people is a Washington where every day is Election Day. We can't wage a perpetual campaign where the only goal is to see who can get the most embarrassing headlines about the other side -- a belief that if you lose, I win. Neither party should delay or obstruct every single bill just because they can. The confirmation of - I'm speaking to both parties now. The confirmation of well-qualified public servants shouldn't be held hostage to the pet projects or grudges of a few individual senators. To Democrats, I would remind you that we still have the largest majority in decades, and the people expect us to solve problems, not run for the hills. And if the Republican leadership is going to insist that 60 votes in the Senate are required to do any business at all in this town -- a supermajority -- then the responsibility to govern is now yours as well. Just saying no to everything may be good short-term politics, but it's not leadership. We were sent here to serve our citizens, not our ambitions. So let's show the American people that we can do it together. This week, I'll be addressing a meeting of the House Republicans. I'd like to begin monthly meetings with both Democratic and Republican leadership. I know you can't wait. Throughout our history, no issue has united this country more than our security. Sadly, some of the unity we felt after 9/11 has dissipated. We can argue all we want about who's to blame for this, but I'm not interested in re-litigating the past. I know that all of us love this country. All of us are committed to its defence. So let's put aside the schoolyard taunts about who's tough. Let's reject the false choice between protecting our people and upholding our values. Let's leave behind the fear and division, and do what it takes to defend our nation and forge a more hopeful future -- for America and for the world. As we take the fight to al Qaeda, we are responsibly leaving Iraq to its people. As a candidate, I promised that I would end this war, and that is what I am doing as President. We will have all of our combat troops out of Iraq by the end of this August. We will support the Iraqi government -- we will support the Iraqi government as they hold elections, and we will continue to partner with the Iraqi people to promote regional peace and prosperity. But make no mistake: This war is ending, and all of our troops are coming home. Tonight, all of our men and women in uniform -- in Iraq, in Afghanistan, and around the world -- they have to know that we -- that they have our respect, our gratitude, our full support. And just as they must have the resources they need in war, we all have a responsibility to support them when they come home. That's why we made the largest increase in investments for veterans in decades -- last year. That's why we're building a 21st century VA. And that's why Michelle has joined with Jill Biden to forge a national commitment to support military families. Now, even as we prosecute two wars, we're also confronting perhaps the greatest danger to the American people -- the threat of nuclear weapons. I've embraced the vision of John F. Kennedy and Ronald Reagan through a strategy that reverses the spread of these weapons and seeks a world without them. To reduce our stockpiles and launchers, while ensuring our deterrent, the United States and Russia are completing negotiations on the farthest-reaching arms control treaty in nearly two decades. And at April's Nuclear Security Summit, we will bring 44 nations together here in Washington, D.C. behind a clear goal: securing all vulnerable nuclear materials around the world in four years, so that they never fall into the hands of terrorists. Now, these diplomatic efforts have also strengthened our hand in dealing with those nations that insist on violating international agreements in pursuit of nuclear weapons. That's why North Korea now faces increased isolation, and stronger sanctions -- sanctions that are being vigorously enforced. That's why the international community is more united, and the Islamic Republic of Iran is more isolated. And as Iran's leaders continue to ignore their obligations, there should be no doubt: They, too, will face growing consequences. That is a promise. As we have for over 60 years, America takes these actions because our destiny is connected to those beyond our shores. But we also do it because it is right. That's why, as we meet here tonight, over 10,000 Americans are working with many nations to help the people of Haiti recover and rebuild. (Applause.) That's why we stand with the girl who yearns to go to school in Afghanistan; why we support the human rights of the women marching through the streets of Iran; why we advocate for the young man denied a job by corruption in Guinea. For America must always stand on the side of freedom and human dignity. Always. We must continually renew this promise. My administration has a Civil Rights Division that is once again prosecuting civil rights violations and employment discrimination. We finally strengthened our laws to protect against crimes driven by hate. This year, I will work with Congress and our military to finally repeal the law that denies gay Americans the right to serve the country they love because of who they are. It's the right thing to do. We're going to crack down on violations of equal pay laws -- so that women get equal pay for an equal day's work. And we should continue the work of fixing our broken immigration system -- to secure our borders and enforce our laws, and ensure that everyone who plays by the rules can contribute to our economy and enrich our nation. In the end, it's our ideals, our values that built America -- values that allowed us to forge a nation made up of immigrants from every corner of the globe; values that drive our citizens still. Every day, Americans meet their responsibilities to their families and their employers. Time and again, they lend a hand to their neighbours and give back to their country. They take pride in their labour, and are generous in spirit. These aren't Republican values or Democratic values that they're living by; business values or labour values. They're American values. Unfortunately, too many of our citizens have lost faith that our biggest institutions -- our corporations, our media, and, yes, our government -- still reflect these same values. Each of these institutions are full of honourable men and women doing important work that helps our country prosper. But each time a CEO rewards himself for failure, or a banker puts the rest of us at risk for his own selfish gain, people's doubts grow. Each time lobbyists game the system or politicians tear each other down instead of lifting this country up, we lose faith. The more that TV pundits reduce serious debates to silly arguments, big issues into sound bites, our citizens turn away. No wonder there's so much cynicism out there. No wonder there's so much disappointment. It lives on in the woman who said that even though she and her neighbours have felt the pain of recession, "We are strong. We are resilient. We are American." The spirit that has sustained this nation for more than two centuries lives on in you, its people. We have finished a difficult year. We have come through a difficult decade. But a new year has come. A new decade stretches before us. We don't quit. I don't quit. Let's seize this moment -- to start anew, to carry the dream forward, and to strengthen our union once more.